Huntsville, AL – Austin Peay State University’s volleyball team opened its four-match road trip with a three-set sweep (25-20, 25-12, 25-9) of Alabama A&M in nonconference action, Wednesday night, at the AAMU Wellness Center. Austin Peay (14-2) needed the early part of the first set to find its rhythm, but when it did it got on a roll. After being tied 9-9 in the first, the Govs broke the first open with a 9-1 run and never looked back. Austin Peay used a 10-4 run to open the second and led the third set wire-to-wire to claim its eighth-straight win. Redshirt junior Christina White finished with 10 kills and a .316 attack percentage to pace the Govs offense. Freshman Brooke Moore added nine kills, three aces and a block. Alabama A&M (5-13) was held to 19 kills as a team, Terra Brooks leading the way with seven kills. FIRST. Austin Peay needed the set’s first half to discover its rhythm, battling host Alabama A&M to a 9-9 tie. Moore broke the tie with a kill, the first point in a 9-1 run that gave the Govs an 18-10 lead. AAMU closed that deficit with a 6-1 run of its own, but White’s kill halted the run and APSU pushed its way to a 25-20 win. White notched six kills in a 15-kill set. SECOND. The Govs took the mystery out of the second set early. A pair of blocks in the set’s first eight points turned the tide in APSU’s favor and Moore later served up six straight points to give the Govs an 11-4 lead. White would later serve up another eight points, including a trio of service aces to extend the APSU lead to 22-7 en route to a 25-12 win. White (four kills) and junior Kaylee Taff (three kills) each had errorless attack outings as the Govs posted 12 kills. .
THIRD. After getting on a roll in the second frame, Austin Peay kept cruising in a wire-to-wire win in the third set. Sophomore Ginny Gerig saw the Govs score nine straight points on her serve as they built a 14-4 lead they would not relinquish. While Austin Peay finished with 13 kills and a .524 attack percentage in the set, Alabama A&M’s offense could not find its stride with just three kills and eight attack errors in the frame. .
White Continues Tear. White’s 10-kill outing was her fourth consecutive double-digit kill outing and fifth in her last five matches. She has led the Govs offense in each match during her current streak. Stucker Stuffs Bulldogs. Stucker handed out a season-low 25 assists in Wednesday’s match but chipped in three kills on three attempts and had four blocks in the win. Service Game Proves Decisive. Austin Peay used its service game to take control of the second and third sets, posting four aces in each of those frames. The Govs finished with 10 service aces, their third best effort this season. 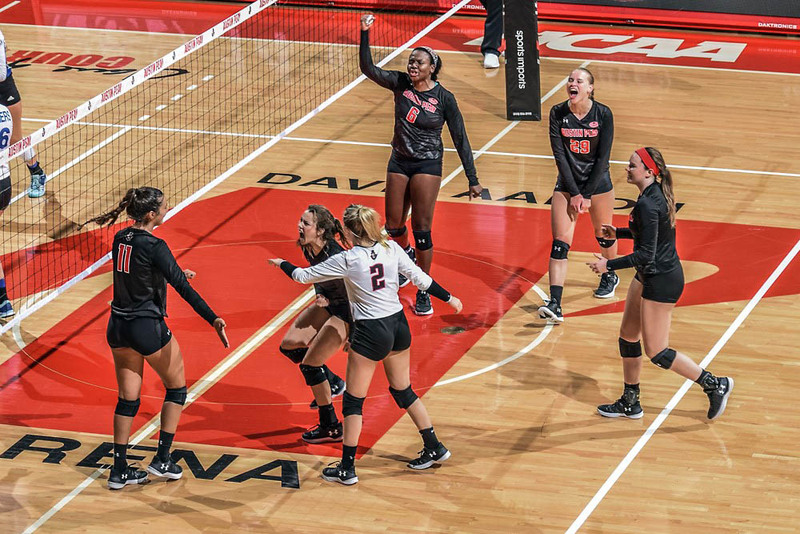 It was APSU’s most aces since the season’s third match – 14 aces against Missouri. Austin Peay now turns its attention to OVC play with a 7:00pm, Friday contest at Southeast Missouri.